Canada has always had a vibrant charter scene taking advantage of the market to the USA and Caribbean as well as across the Atlantic Ocean to the UK and Europe. Wardair was the pacesetter (see the Air Canada genealogy) and was joined by most of the regional airlines in the 1970s (notably Pacific Western, Nordair and Quebecair). The regionals all bowed out of the charter arena in the late 70s and the vacuum was filled by new startups in the mid-late 80s like Nationair, Air Transat and Canada 3000. These airlines often leased out their aircraft to Europe in their summer and accordingly leased in European aircraft in their winter. 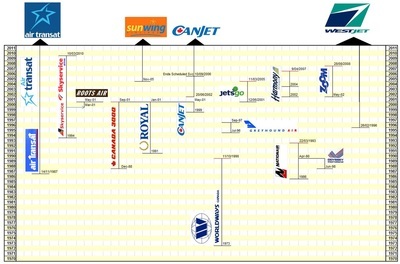 Wardair was taken over by Canadian in the late 80s and Worldways and Nationair exited the market in the early 90s. Following Canadian's absorption by Air Canada, in 2001, Canada 3000 made an, ultimately unsuccessful, bid to fill its place absorbing Royal and CanJet and starting scheduled services just prior to 9/11, which dealt it a shattering blow. Another airline which also tried to take up the mantle of a full service carrier was Roots Air, a joint venture between charter airline Skyservice and the clothier Roots Canada. This ill-fated start up lasted only a couple of months before competition from Canada 3000 and Air Canada ed to its collapse and buy out by Air Canada. Meanwhile low cost airlines began to make themselves felt. Greyhound Air was an early short-lived attempt but by 2001 WestJet, a reformed CanJet and JetsGo all competed against Air Canada's low cost Zip offshoot and the mainline carrier. Only Westjet has been ultimately successful providing a true second option to Canadians once again. Canjet has survived but only by relinquishing all its scheduled services and reverting to a charter only operation from September 2006. Air Transat meanwhile has been able to carry on regardless as the only surviving major long-haul charter carrier despite short-lived incursions from Harmony and Zoom. Since 2005 the other main contender in the charter space is Sunwing Airlines, which has grown rapidly to operate 26 737-800 mainly on charters to the USA, Mexico and Caribbean. 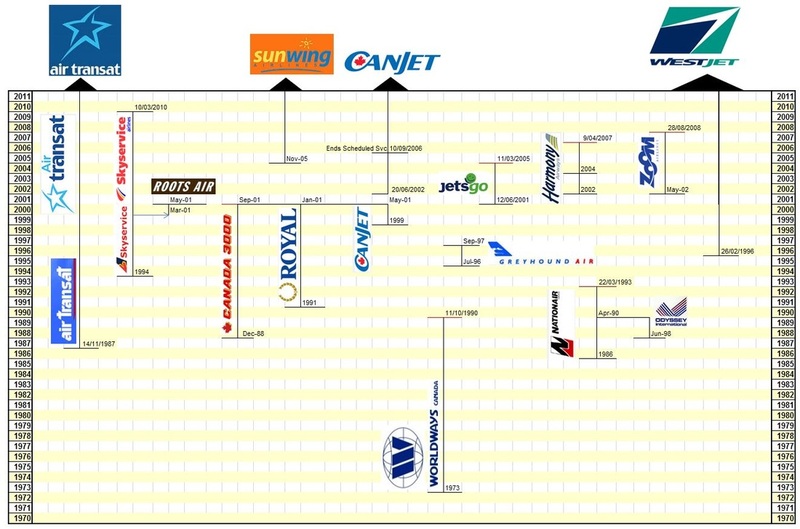 The long running Skyservice, which had been an industry survivor, was killed off by the merger of its major trade partners Signature Vacations and Sunwing Travel and the realignment of their business to Sunwing Airlines.